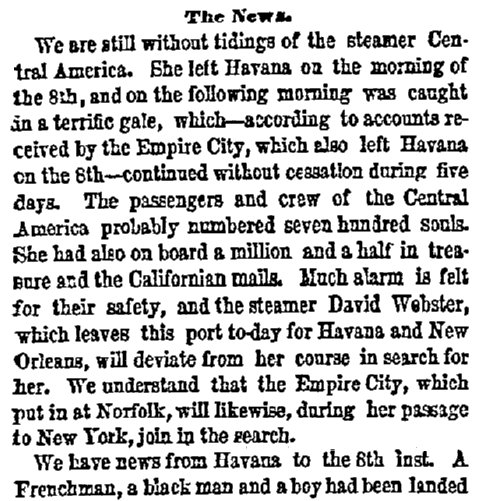 At 9 o’clock the morning of 8 September 1857, the U.S. mail ship SS Central America steamed out of Havana, Cuba, on the final leg of its trip to New York City. The weather was beautiful, with blue skies and small puffy clouds, a continuation of the fine weather the ship had been experiencing for a week. There was a festive atmosphere onboard, many of the 477 passengers having enjoyed success in the California Gold Rush, and now they were coming back to the East Coast to spend their new-found wealth. There was much partying in Central America’s saloon and parlors while other passengers leisurely strolled on the ship’s deck. Illustration: SS Central America. Credit: Frank Leslie’s Illustrated Newspaper; Library of Congress, Prints and Photographs Division. But this was no pleasure cruise – the Central America was heading straight into a disaster, and four days later it lay on the bottom of the Atlantic, with more than 400 people dead and tons of California gold lost. No one could have predicted such a catastrophe. The Central America was in the capable hands of Captain William Lewis Herndon, who had served with distinction during the Mexican-American War, and its seasoned crew of 101 sailors performed their tasks with efficiency. The run it was making – a round trip from New York City to Panama – was one it had completed 43 times since being launched in 1852. There was no reason to think the 44th trip would be any different – but then, no one was anticipating a ferocious hurricane with winds raging at 105 miles per hour. 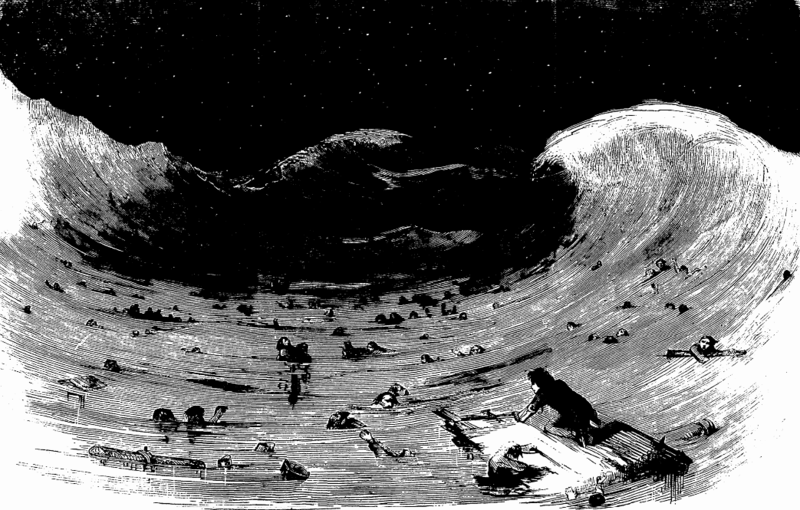 The passengers from the California gold fields were making a very ordinary journey for that era. They had steamed from San Francisco to Panama, then crossed the isthmus on a train to meet up with the Central America at Aspinwall (modern-day Colon). While they were boarding, a valuable cargo that had also been transported from San Francisco was loaded onto the Central America: tons of gold – including nuggets, bars, and newly-minted $20 coins – as well as nearly 40,000 pieces of mail. Fully laden, the Central America left Panama on 3 September 1857, made its stop at Havana, then headed to New York City on September 8. It never made it to New York. Early the next morning, September 9, the ship’s crew noted the wind was picking up, but there was nothing alarming in that. Except for one thing – the wind kept getting stronger and stronger, because a Category 2 hurricane was bearing down on the Central America. The partying and leisurely strolling stopped, many passengers overcome with seasickness as the ship was tossed about in the heavy swells. The wind, rain and waves increased in intensity and battered the ship over the next two days. The Central America sprang leaks, the water putting the fire out in the boiler, and the paddlewheel and pumps stopped working. Alarmed, the passengers and crew formed a bucket brigade to bail out the sinking ship, while Captain Herndon ordered the flag flown upside down – a universal distress signal. By Saturday, September 12, the ship was doomed. That afternoon another ship was spotted, the Marine out of Boston, and Captain Herndon ordered the women and children into the Central America’s lifeboats to make the hazardous transfer to the Marine. Around 150 women and children made it before the weather forced the Marine to leave. The male passengers and crew could not make the transfer. Most of them were still on board when the Central America sank around 8 o’clock that night, settling on the sea floor about 8,000 feet below the surface, 160 miles offshore. About 425 men underwent a harrowing, frightful ordeal, spending the night desperately trying to stay afloat and praying another ship might come to save them. In the last newspaper article reprinted below, a survivor tells of the anguish of watching exhausted men giving up one by one and slipping under the surface. 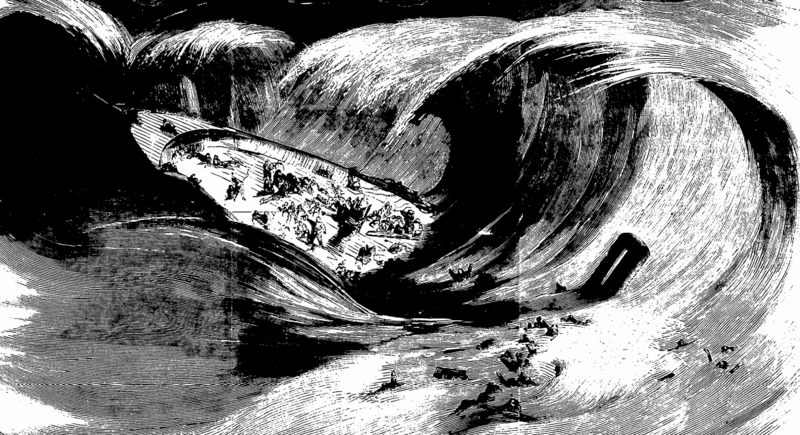 When a Norwegian ship came upon the scene the next morning, there were only 49 men left alive. 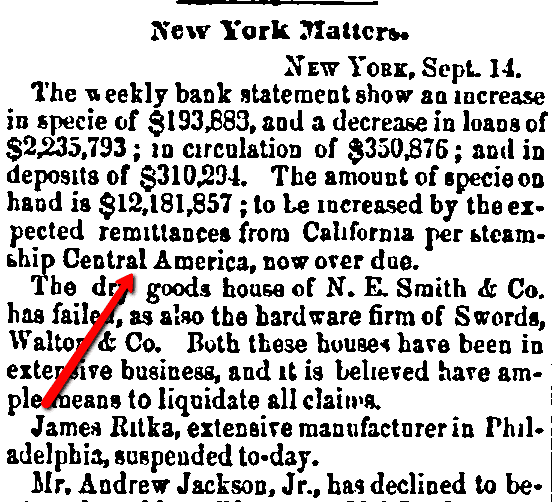 The loss of the Central America’s gold – valued around $2 million (in 1857 dollars) – caused the failure of several New York banks and was a direct factor in the financial collapse historians call the Panic of 1857. In 1985 an engineer named Thomas G. Thompson founded the Columbus-America Discovery Group to find the wreck, and in 1987 they found the Central America, one of the most astonishing finds in the history of treasure hunting, recovering $100-150 million worth of gold – including one gold bar that weighed nearly 80 pounds! After a decade of litigation with insurance companies, the courts awarded the Columbus-America Discovery Group 92% of the recovered treasure. The following seven newspaper stories show how the loss of the Central America was reported. 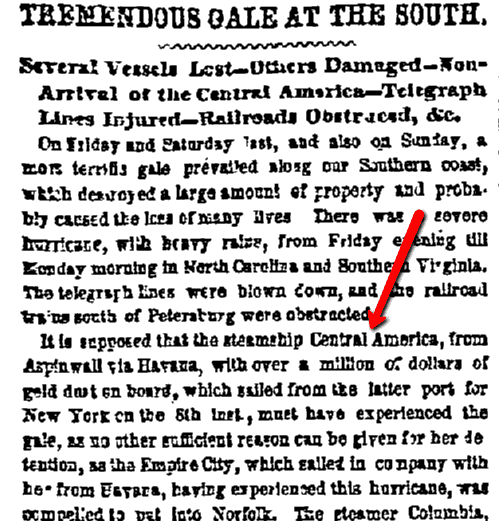 The first article merely notes the ship is “now over due”; the second reports on the hurricane and speculates the “detention” of the Central America is probably due to the gale; the third article comments that “much alarm is felt for their safety”; these concerns are raised to “serious apprehensions” in the fourth article. Finally, in the next two articles, the disaster is reported – and in the seventh and final article, we get the first-hand account of one of the few male survivors, Henry H. Childs. The weekly bank statement[s] show an increase in specie of $193,883, and a decrease in loans of $2,235,793; in circulation of $350,876; and in deposits of $310,294. The amount of specie on hand is $12,181,857; to be increased by the expected remittances from California per steamship Central America, now over due. Several Vessels Lost – Others Damaged – Non-Arrival of the Central America – Telegraph Lines Injured – Railroads Obstructed, &c.
On Friday and Saturday last, and also on Sunday, a most terrific gale prevailed along our Southern coast, which destroyed a large amount of property and probably caused the loss of many lives. There was a severe hurricane, with heavy rains, from Friday evening till Monday morning in North Carolina and Southern Virginia. The telegraph lines were blown down, and the railroad trains south of Petersburg were obstructed. It is supposed that the steamship Central America, from Aspinwall via Havana, with over a million of dollars of gold dust on board, which sailed from the latter port for New York on the 8th inst., must have experienced the gale, as no other sufficient reason can be given for her detention, as the Empire City, which sailed in company with her from Havana, having experienced this hurricane, was compelled to put into Norfolk. The steamer Columbia, from New York, which arrived at Charleston at three o’clock on Monday afternoon, experienced the gale off Hatteras, and had her paddle boxes carried away, but otherwise she was little damaged. Captain Berry reports that the blow lasted twenty hours. By a telegraphic dispatch received yesterday, we learn that a number of vessels were wrecked on the coast of North Carolina, and we shall probably receive further accounts, today or tomorrow, of disasters to vessels which were in the track of the storm. We are still without tidings of the steamer Central America. She left Havana on the morning of the 8th, and on the following morning was caught in a terrific gale, which – according to accounts received by the Empire City, which also left Havana on the 8th – continued without cessation during five days. The passengers and crew of the Central America probably numbered seven hundred souls. She had also on board a million and a half in treasure and the California mails. Much alarm is felt for their safety, and the steamer David Webster, which leaves this port to-day for Havana and New Orleans, will deviate from her course in search for her. We understand that the Empire City, which put in at Norfolk, will likewise, during her passage to New York, join in the search. 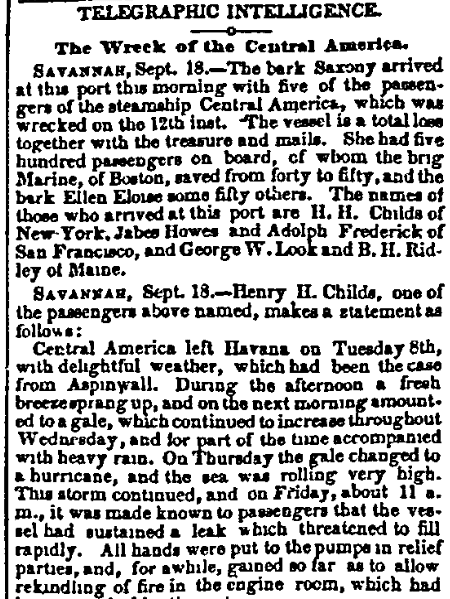 On Friday, Saturday and Sunday last, a terrible gale swept along our southern coast, destroying a large amount of property, and probably a number of human lives…The steamer Central America, from Aspinwall, which left Havana September 8th, having on board the California mails and a large amount of treasure, is supposed to have encountered the gale in its greatest severity, and serious apprehensions are felt in regard to her safety…The anxiety relative to the Central America is further increased by the report of Captain Gager, of the steamer Atlanta, which arrived at New York yesterday morning from Charleston, which port she left on Saturday, who states that on Monday, 13th inst., off Cape Lookout, passed a quantity of wrecked material, supposed to be a steamer’s wheel house and house on deck. 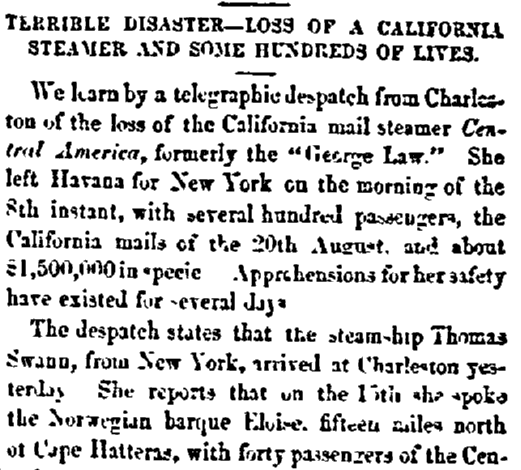 We learn by a telegraphic despatch from Charleston of the loss of the California mail steamer Central America, formerly the “George Law.” She left Havana for New York on the morning of the 8th instant, with several hundred passengers, the California mails of the 20th August, and about $1,500,000 in specie. Apprehensions for her safety have existed for several days. 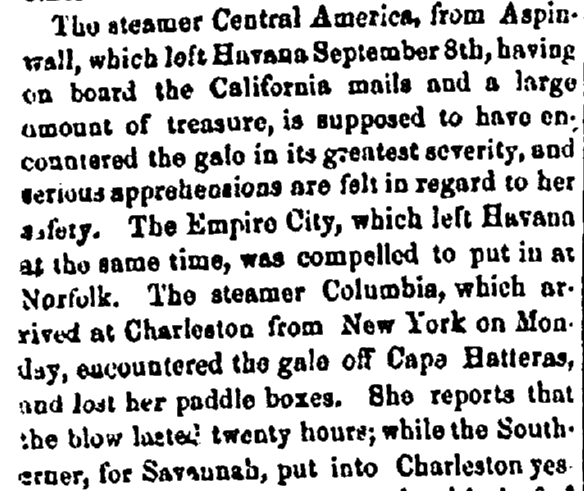 The despatch states that the steamship Thomas Swann, from New York, arrived at Charleston yesterday. She reports that on the 15th she spoke the Norwegian barque Eloise, fifteen miles north of Cape Hatteras, with forty passengers of the Central America on board. The passengers reported that the Central America foundered at sea on the 12th instant, with five hundred passengers, beside her crew, and that only sixty of the whole number on board were saved. This is truly an appalling disaster, and one which must inflict intense pain. The passengers on these steamers belong generally to almost every section of the country. How may bright hopes of returning and expecting friends and relatives have been dashed – how many homes made desolate! Additional Particulars of the Injury to Shipping in the Late Gale, &c., &c., &c.
The steamship Thomas Swann, from New York, has arrived at this port, and reports having spoken, on the 15th inst., about fifteen miles north of Cape Hatteras, the Norwegian bark Elise, which had on board forty of the passengers of the steamship Central America. The passengers stated that the Central America foundered on the 12th inst., and that only sixty out of over five hundred passengers were saved. Nothing is mentioned concerning the specie she had on board. The steamship Thomas Swann, arrived here, reports speaking a brig with sixty of the individuals saved from the Central America, which foundered at sea on the 12th – all the rest on board lost. No mention made of the specie. The Central America left Havana at 9 o’clock on the morning of Tuesday, the 8th inst., under the command of Lieutenant Herndon, of the United States Navy, a most efficient officer. She had something over five hundred passengers on board, the exact number not being known, and these, with the ship’s company, amounted in all to probably six hundred and twenty-five persons. She carried treasure to the amount of a million six hundred thousand dollars, and a valuable cargo and mails from the Pacific. On the evening of the 9th the heavy gale, which has proved so destructive on our Southern coasts, set in from the northwest, and it came to its height on Saturday, 12th inst., when it blew a perfect hurricane. And it was in this awful tempest that the Central America foundered, carrying down with her five hundred souls. The owners of the Central America were yesterday making every exertion to obtain intelligence of the missing ship. Mr. Roberts, the agent in this city, received a despatch yesterday from Captain McGowan, of the Empire City, now at Norfolk, informing him that his vessel, notwithstanding the heavy damage she sustained, would be ready for sea to-day; and Mr. Roberts accordingly directed him to proceed at once in search of the Central America, leaving to his own discretion the track he should take and the arrangements he may deem desirable to further his purpose. The Daniel Webster, which left this port yesterday, will also keep in the track of the late gale, and preserve a vigilant lookout for any traces of the missing vessel. It is hoped that these vessels may fall in with some of the wrecked passengers of the Central America who may possibly be floating in the sea upon portions of the wreck. This hope, however, it must be confessed, in view of all the circumstances of the case, rests upon but a fragile foundation. Savannah, Sept. 18. – The bark Saxony arrived at this port this morning with five of the passengers of the steamship Central America, which was wrecked on the 12th inst. The vessel is a total loss together with the treasure and mails. She had five hundred passengers on board, of whom the brig Marine, of Boston, saved from forty to fifty, and the bark Ellen Eloise some fifty others. The names of those who arrived at this port are H. H. Childs of New York, Jabes Howes and Adolph Frederick of San Francisco, and George W. Look and B. H. Ridley of Maine. Central America left Havana on Tuesday 8th, with delightful weather, which had been the case from Aspinwall. During the afternoon a fresh breeze sprang up, and on the next morning amounted to a gale, which continued to increase throughout Wednesday, and for part of the time accompanied with heavy rain. On Thursday the gale changed to a hurricane, and the sea was rolling very high. This storm continued, and on Friday, about 11 a.m., it was made known to passengers that the vessel had sustained a leak which threatened to fill rapidly. All hands were put to the pumps in relief parties, and, for awhile, gained so far as to allow rekindling of fire in the engine room, which had been quenched by the water. This gain was soon lost, and the fires again extinguished. The work of bailing went on over the ship throughout Friday evening and night – the passengers and crew keeping good hearts, and hoping that with daylight they would speak some vessel. About 2 p.m. on Saturday, the storm abated and a calm ensued, and thus continued the hopes of all, and nerved them for the work of bailing. At 4 p.m., a sail was announced, and the steamship fired signals, and displayed colors at half-mast. This proved to be the brig Marine of Boston, which came up and spoke to us to receive our reports, and then laid off a mile. The steamship had but three boats left, into which all the women and children were put, and transferred to the brig. Later in the evening another sail was seen fast approaching. Capt. Herndon reported condition to it and asked to lay aside. A favorable answer was returned, but instead of approaching, the vessel passed out of sight. At 7 p.m. it was found the steamer could not hold out much longer, as a heavy sea then swept over her for the first time. Life preservers were distributed, rockets fired, and soon after the vessel went down, leaving at mercy of the waves from four hundred to four hundred and fifty persons. The sea was then calm, and we all kept together, and cheered each other as well as the stoutest could. We thus kept together, I think, for two or three hours, nearly all being preserved so long except those who could not swim at all. Exhaustion then began to overcome one after another, and I saw them going down around me. At 1 a.m. Saturday morning I was nearly alone – could hear shouts of a few survivors, but could see none. About 2 a.m., as I reckoned, saw a vessel at a distance of a mile or less, took fresh courage, and swam towards it – reached it in last efforts of exhaustion, and was drawn up by ropes. It was a Norwegian bark, from Belize for Falmouth. I found on board three of my comrades, survivors, and before 9 o’clock, we had forty-nine of them in all – which are all I know to have been rescued. We kept near the place, and in anxious watching, until we believed all living had been picked up, and then made sail, the bark being short of provisions, and the crew living on gruel; we found a little tea and coffee also. At noon on Sunday, we spoke the American bark which supplied provisions, but took on board the five survivors brought to this city, whose names are B. H. Ridley, Maine; Jabez Howes, San Francisco; Sam. W. Locke, Maine; Adolphus Fredericks, San Francisco; and H. H. Childs, New York. The Norwegian bark set sail for Charleston, or the first port, with the rest of survivors. Note: An online collection of newspapers, such as GenealogyBank’s Historical Newspaper Archives, is not only a great way to learn about the lives of your ancestors – the old newspaper articles also help you understand American history and the times your ancestors lived in, and the news they talked about and read in their local papers. Did any of your ancestors try to strike it rich during the California Gold Rush? Please share your stories with us in the comments section. And… Thompson eventually absconded. He and a female accomplice disappeared, leaving investors with almost nothing. He was eventually arrested, but remains in prison, unwilling to let the secret out about the rest of the gold. The story is told well in “Ship of Gold” by Gary Kinder, though it came out before Thompson’s arrest. Thanks for the article. The newspaper accounts were particularly interesting. Thanks for adding to our understanding of this story, Charles. Are there existing passenger/crew lists? Tony- great article! My third great aunt, Mary Sawyers Swan, was on that fateful voyage of the SS Central America with her husband, Samuel P. Swan, and their 21 month old daughter, Martha “Lizzie.” Mary and Lizzie were rescued by the brig Marine together with all 60 of the women and children. Sam was one of the 427 men who went down with the ship. In 1854, Mary (then 15) and her family travelled by wagon train from Missouri to the gold fields in Northern California. Her father, Thomas–as were so many men–was consumed with gold fever. A month into the 4 month trek, their train was attacked by Pawnee Indians, and Mary’s oldest sister, Melcena Sawyers Case, was shot in the shoulder. She survived, but would never fully recover from her wounds. Mary unexpectedly ran into Sam Swan at the Rough and Ready Camp-they knew each other in Missouri–and married at the Camp in 1856. Mary’s father, brother (Mountjoy King Sawyers) and brother-in-law, James Case’s attempts didn’t pan out, and they gave up their quest for gold after a couple of hard years and settled in Willits (Mendocino County) CA. Sam had some luck and, in August of 1857, with $10,000 of gold dust and coin stuffed in a money belt, he and his young family boarded the steamship Sonora in San Francisco bound for Panama City, and an ultimate destination of Pittsburgh to visit Sam’s family. Mary was 17 at the time with baby Lizzie. After crossing the Isthmus by rail, they boarded the SS Central America, Capt. William L. Herndon, commanding. Before Mary and Lizzie left the stricken ship, Sam gave his money belt to Mary and strapped Lizzie on her back. He told her “I don’t know that I shall ever see you again. If you are saved, this (money belt) will be a good friend to you–if you drown, it will help carry you to the bottom.” As Mary was leaving the ship, Captain Herndon gave her his gold watch and chain and asked “If you should survive, please try to get this to my wife and daughter in Albany New York. ” The Captain’s daughter, Ellen, 20, was at that time engaged to a young lawyer, Chester Arthur. When Mary and the survivors arrived in New York City, someone volunteered to carry the watch and its story to Mrs. Herndon. Ellen and Chester married in 1859, and in 1881 Arthur became the 21st President of the United States upon the assassination of James Garfield under whom Arthur served as Vice President. Mary and Chester Arthur corresponded regularly up until his death in 1886. Captain Herndon’s watch was passed down from Ellen to their son, Chester Arthur Jr. This is only a fraction of Mary’s adventuresome life. She and her new husband and their six kids ended up moving to California and settling in Willits in 1876. Mary passed in 1924 at age 85. A very full life, indeed. Thanks for writing us. The story you tell of Mary’s incredible life is amazing; I hope our readers enjoy it as much as I did!